and will send a CD to you, at cost, £5.00 UK and £6.50 overseas. We have had a letter in to say this is indeed No 1. 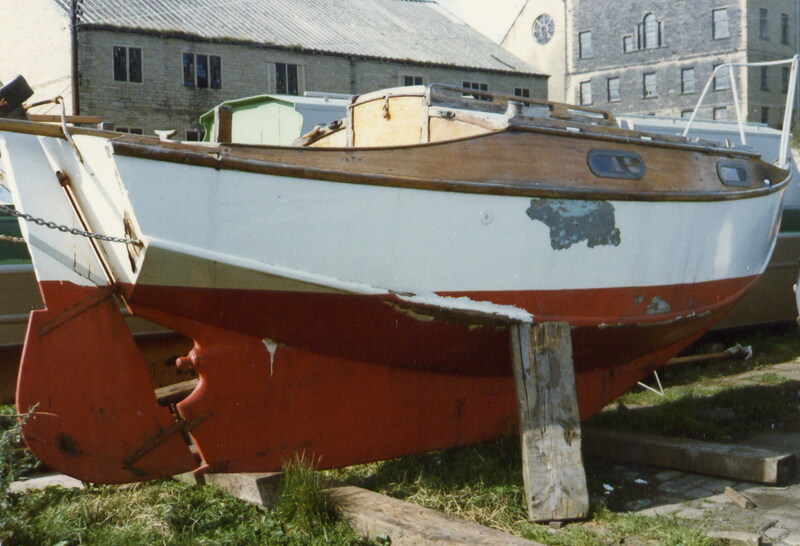 She was named, 'WildDuck' She was built at the Elephant Boatyard by the apprentices as a test. built for a Mr. Greaves of Motorcycle fame. 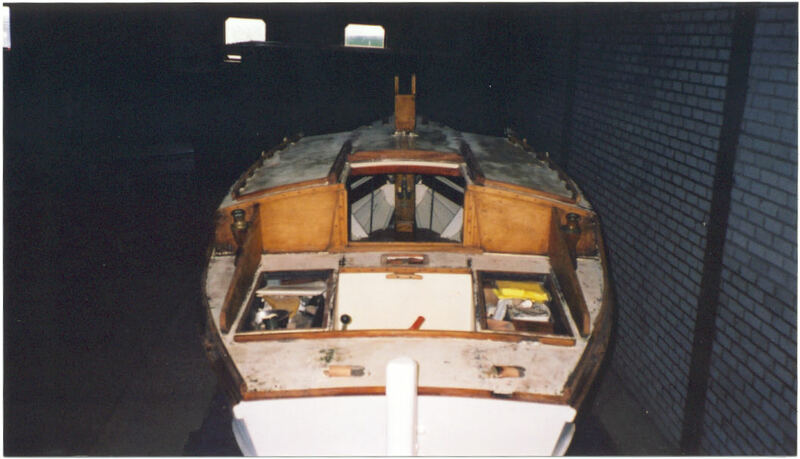 Sadly she was destroyed by fire in a boatyard, many years ago, but not before Beken of Cowes had her in his sights! Photo to follow. 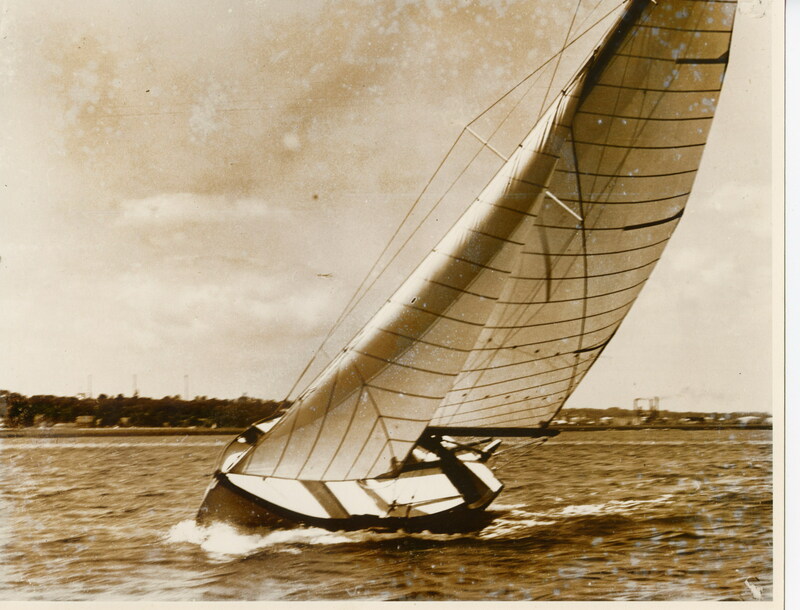 This is a 'Beken of Cowes' shot of the first WD No 1. 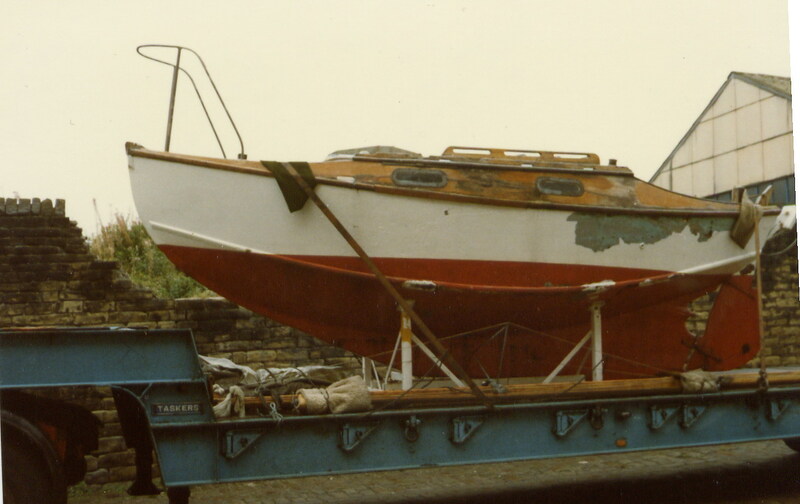 Here she is in later years in the North West, alongside the Canal. 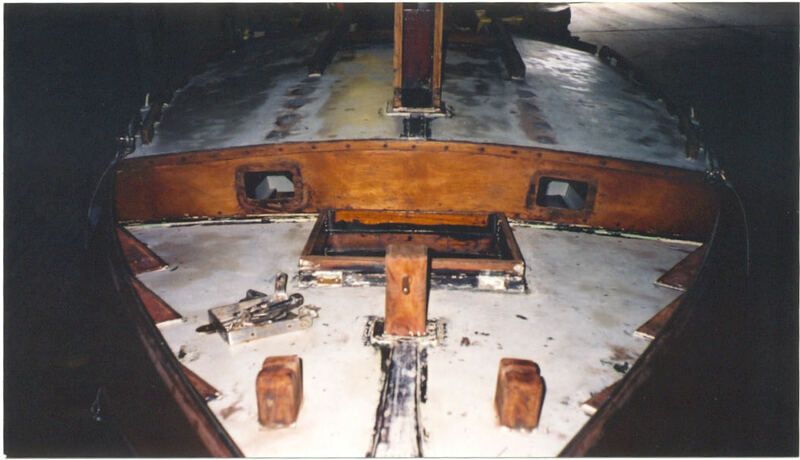 You can see the amount of work going into her restoration. Sadly shortly after these pictures were taken she was lost in an accidental fire at the yard. This WD was met in Holland at the Goes Meet in July 2004. Her name is 'Die Struise', Which apparently means the strong woman. I do hope I have got that right. The owners, from Holland, Thius and Irena joined us as we arrived for a celebration drink or two! Here we are with Thius, his WD just visible in the background at Goes! If you look very carefully at the bow shot of 'Die Struise', you can just make out the words, Wild Duck! She is a slightly stretched version, about 25ft long. 'The Wild Duck'Owned by Frank and Marleen Berlee based in Holland, this is possibly Holland's only 'wooden' Wild Duck. Seen here spanking along in a force 6 on the "Hollands diep" water in the southern part of Holland. These pictures are very large but are of outstanding quality - well worth the wait for them to download. 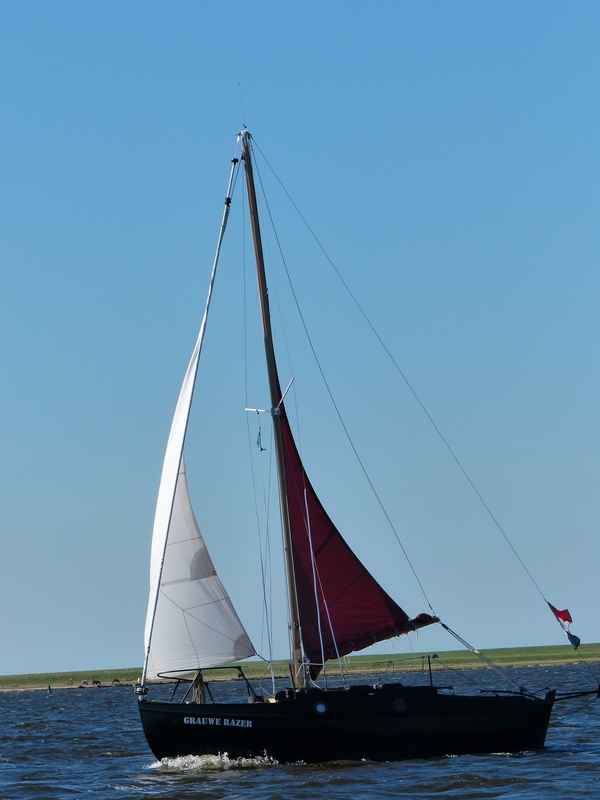 As above, very efficient the Dutch, note the arrow on the foresail to denote which way up the boat should be! Just looking at these pictures doesn't it make you want to sail one, or even build one? 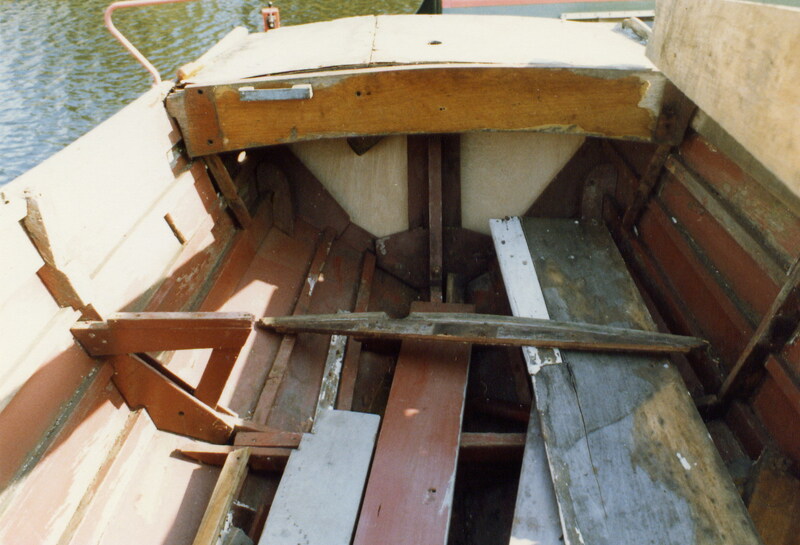 These are all pictures of 'The Wild Duck' based in Holland. If ever there was a need for Broadband, it's to view these pictures. 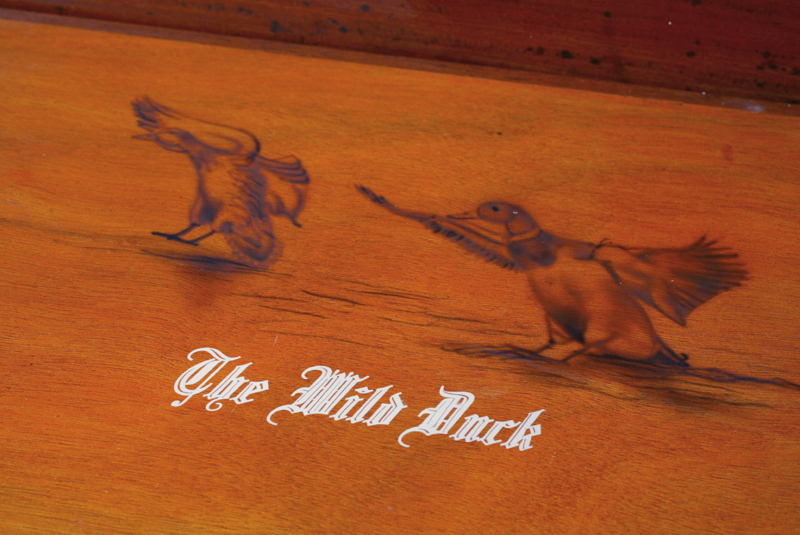 This is the story of our 'Wild Duck'. Frank has a friend living at nearby a harbour. He was filming his friend’s new boat and there we saw the ‘Wild Duck’. It was love at first site. But, she was not for sale. Two years earlier there was a sign with ‘For Sale’. 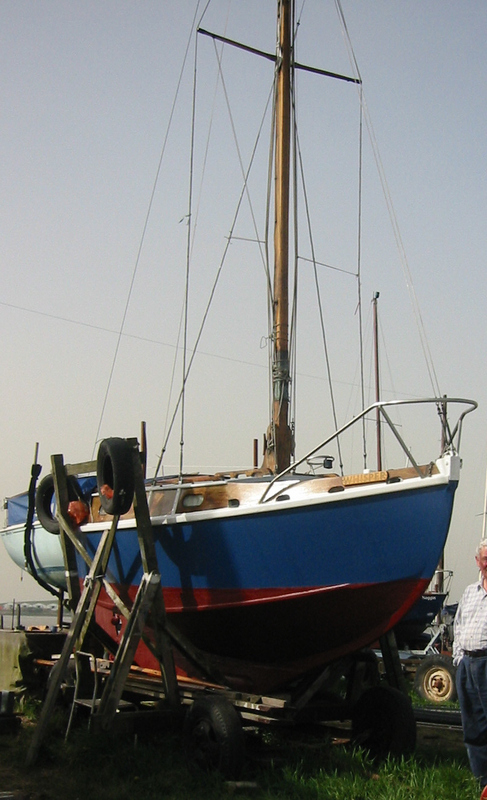 She was still lying in the same harbour so we thought that she was still owner by a Mr Kooper. 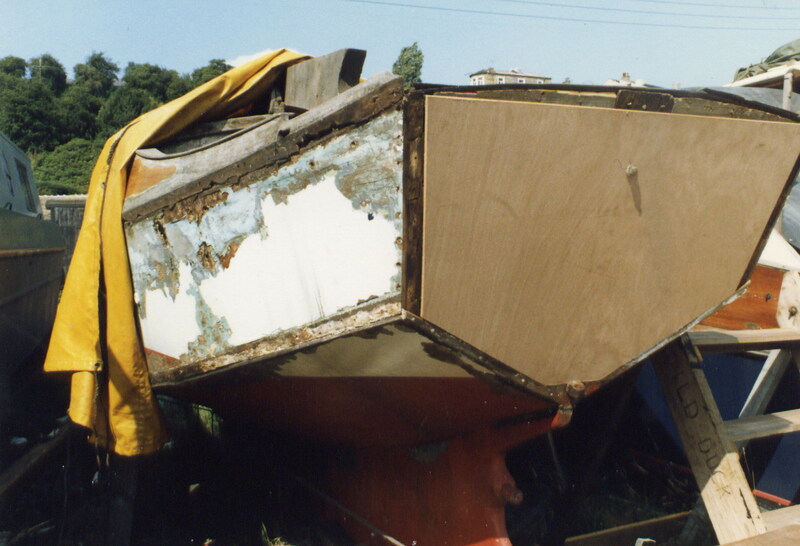 We phoned Mr Kooper and asked him if he still wanted to sell the boat. He told us he had sold her a year ago to a neighbour. That’s why the boat was still lying there. 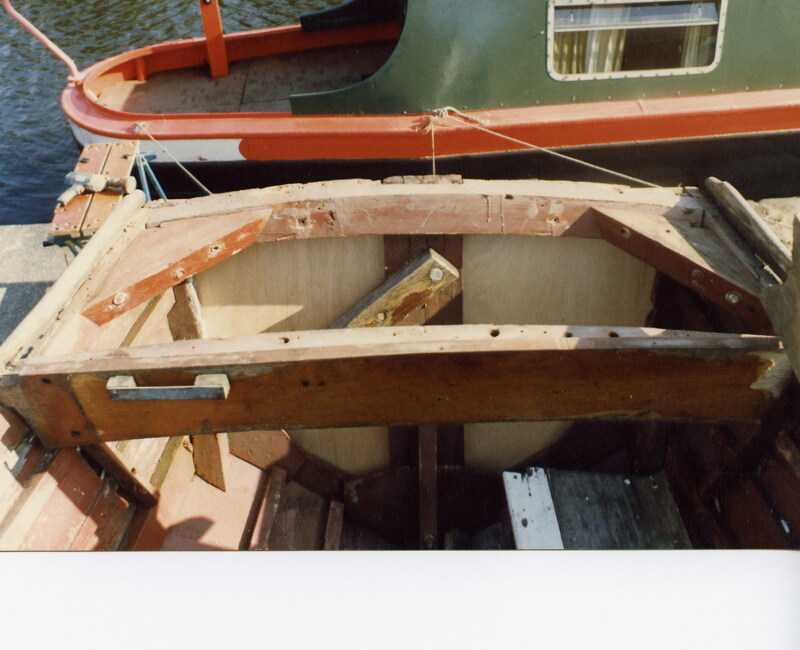 Mr Kooper told us that the new owner would sell the boat again. 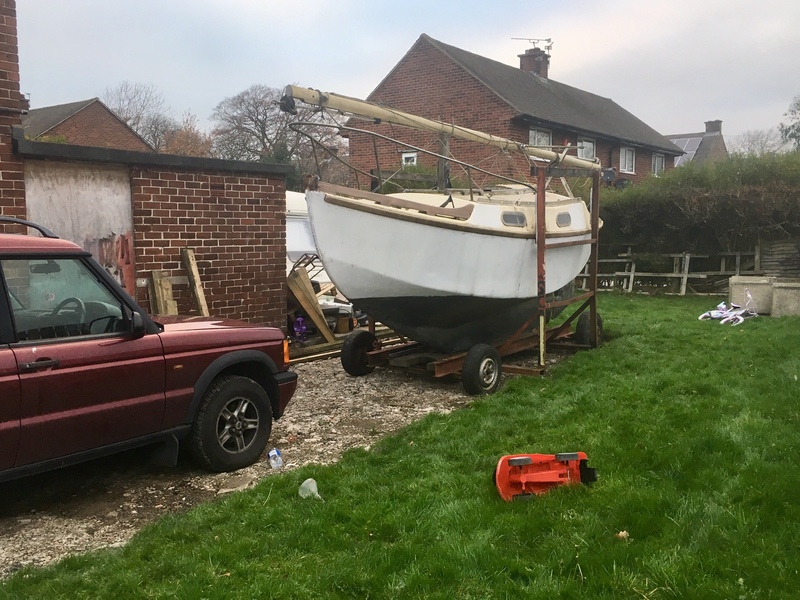 He had already bought a bigger sailing boat. I got a email address in Bali (Indonesia). I emailed the owner of the Wild Duck to sell us the boat and he did. He send a friend from Holland to us, so we looked at the boat and within 15 minutes we had bought our Wild Duck. It was June 2001. 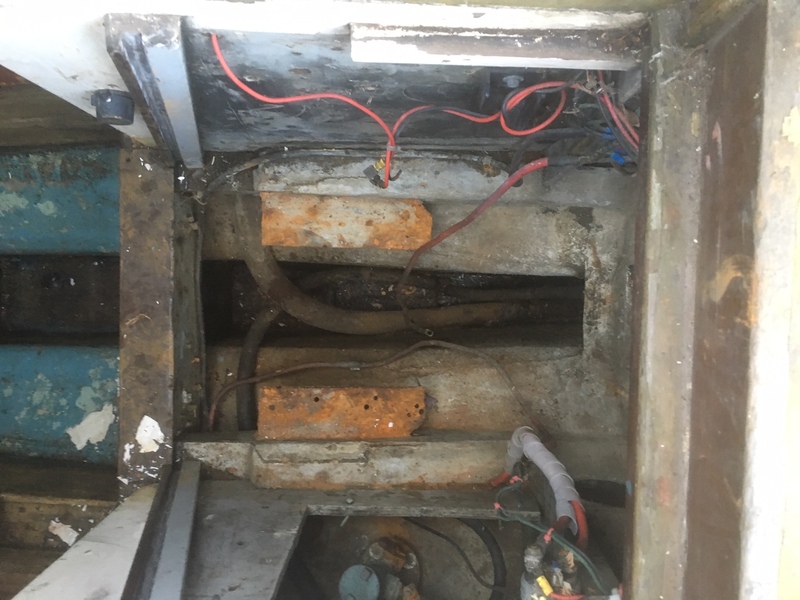 All we had to do was cleaned her up and we sailed the whole summer. In October we found a big shed for the winter. There she lays every winter now. 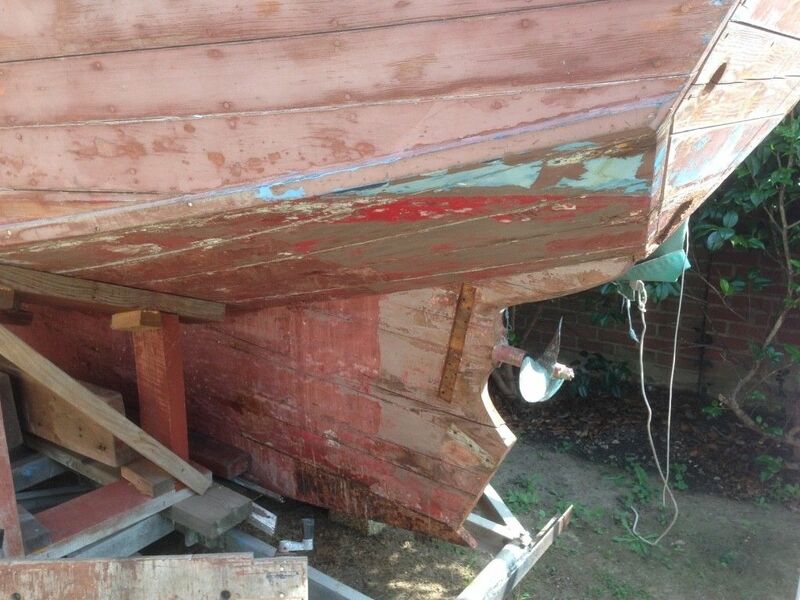 When she was laying in the shed we took all the parts from the boat which came off. 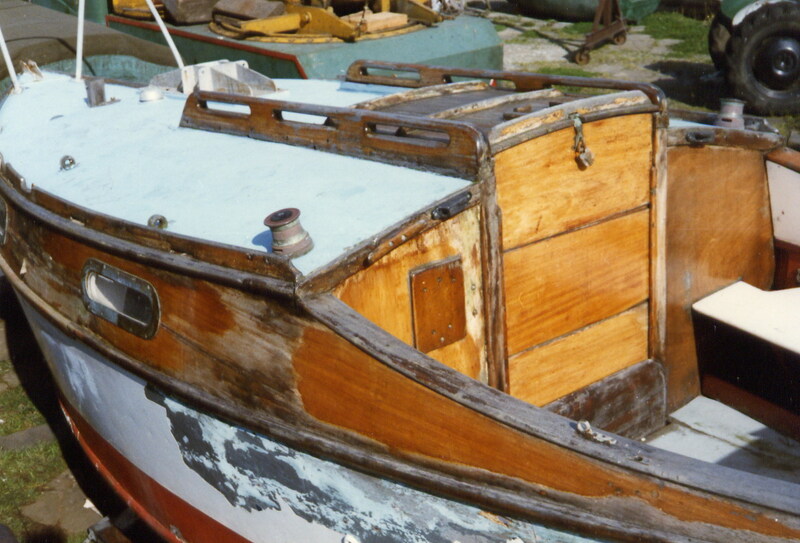 We removed the old paint until she was back to bare wood. There were no rotten places. She looked like she did when she first came from the builder. The wood was still intact. 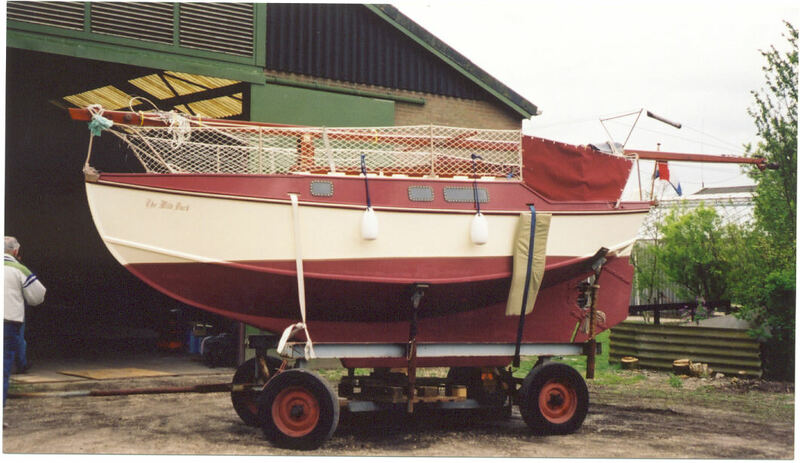 We painted her in the new colours, Bordeaux red and broken White. 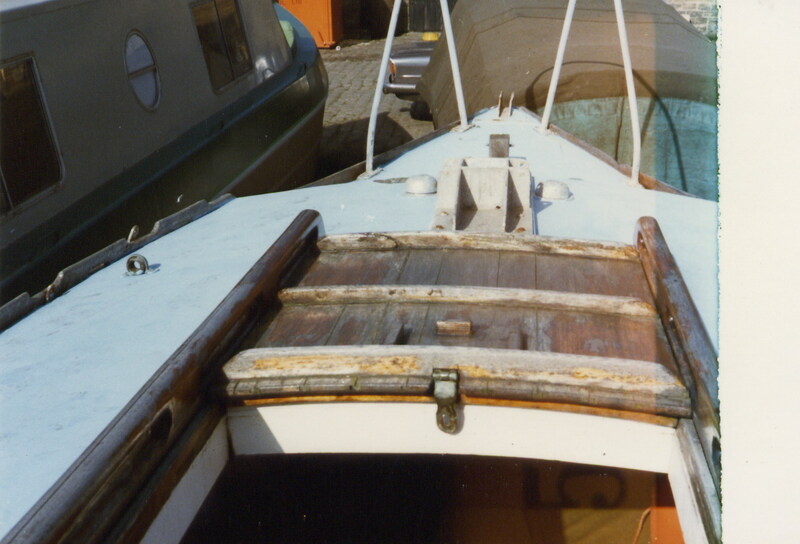 The only things we replaced where the ropes and the fenders. We gave her a new name ‘ The Wild Duck’ because we think she is the only wooden Wild Duck in Holland. 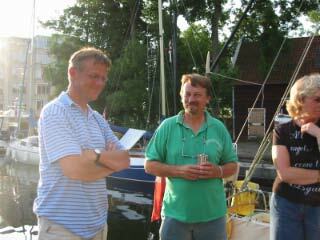 The next summer we sailed to our harbour, and a guy who works for a boat magazine ( The Waterkampioen) saw us. He asks us if he could do a story on our boat in his magazine. So he came and asked us everything about our boat and his boss published it in the magazine. 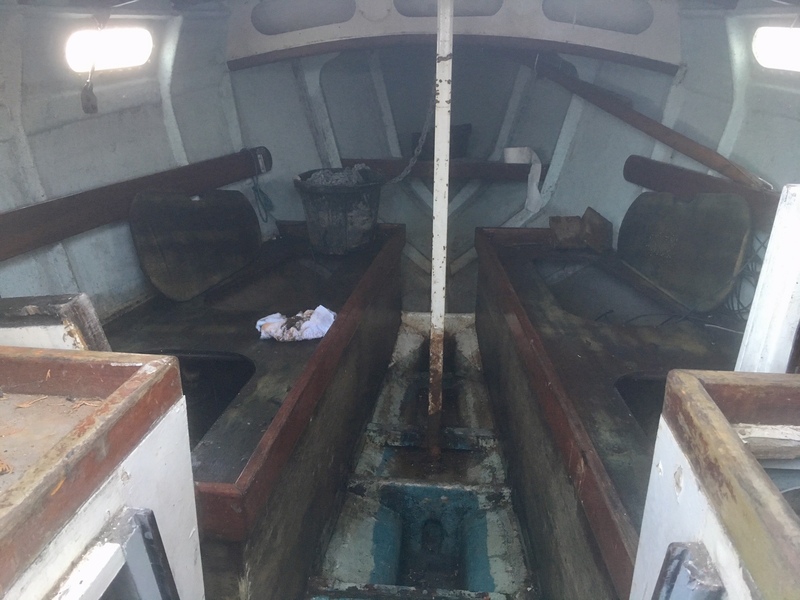 After the story was published we got an email from the brother of the builder and he told us that the boat was build in 1964 so she is 40 years old. Everywhere we go we get good reviews. She is not a very fast sailing boat, but she is very steady. When they took the pictures we sent, the wind was force 6, nearly 7. We were sailing with everything we had. Then we felt point zero. It was very scary. Marleen thought we flipped over. But the Wild Duck didn’t. She rolled back and we sailed on. The pictures we had send you where taken that day. There are some photo’s you can see how far we went over. 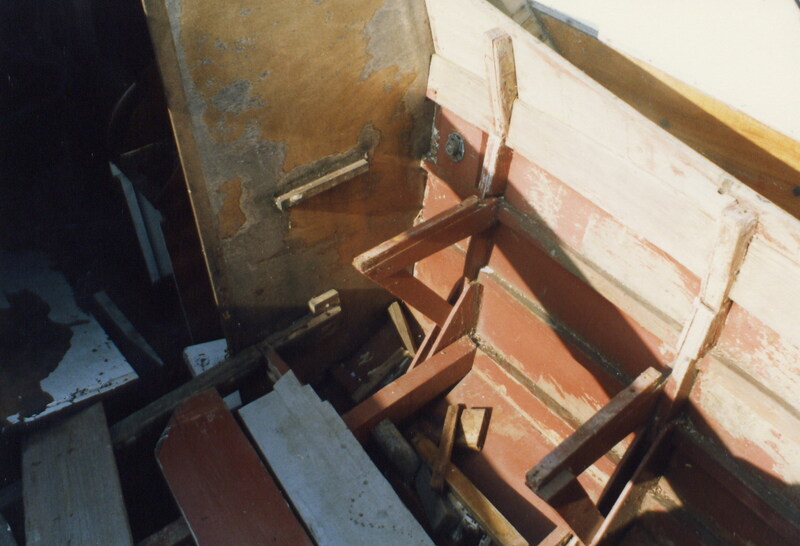 Inside the boat we haven’t done anything. Now we have 3 sleeping places and a little kitchen. Frank wants to make one big bed and a sleeping place for our dog (It’s a Rottweiler). He will remove the kitchen from the inside to the outside. Where we are sitting outside he will make the kitchen. There we can put a sail above, so we can sit dry and make things and the boat will stay clean when we are not sailing. That’s work for next year. Greatings Marleen and Frank Berlee. Here we have the long awaited pictures of another steel Wild Duck from Holland, 'Beautje' She belongs to Mr. Louis Schwartz, who moors her in Amsterdam. For more photos of her click here. She is a Beauty! 2019 and a name change to Goosander! 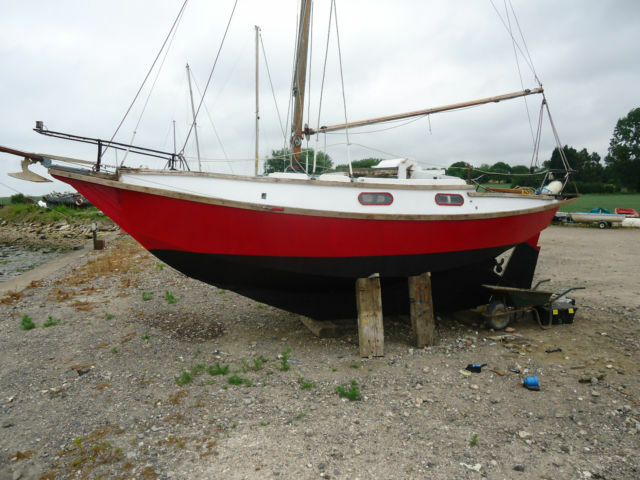 New owner Sjors has contacted us to tell us she is just going ashore for a refit. Hope to see sailing pics and an enrolment soon! 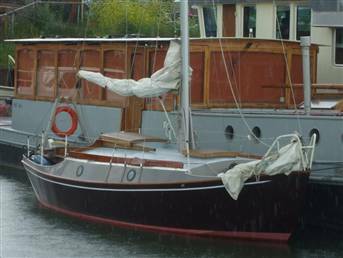 'Whisper' Built by Malcolm Smith and sailed for years on the London River, this beautiful little boat is up for sale, see the for sale page. 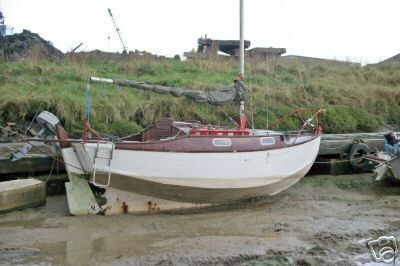 The current owner Mr. Dow has her ashore at Erith Kent, for viewing. 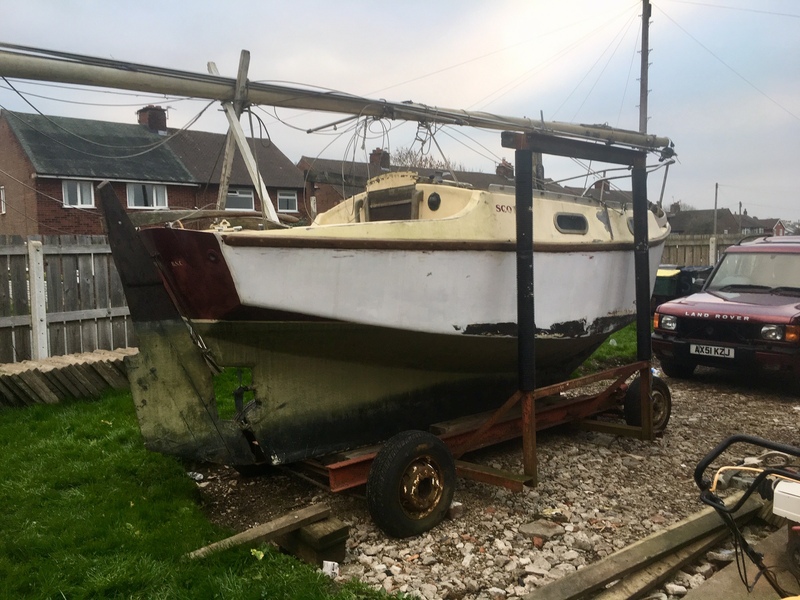 'Tarka' was owned by Brendan Mason our ex webmaster, sadly the project was abandoned when Brendan became ill and she has now rotted away. All scrapped. 'Pochard' This picture has just come to us from Australia! From a dealer of YM drawings out there 30 years ago... 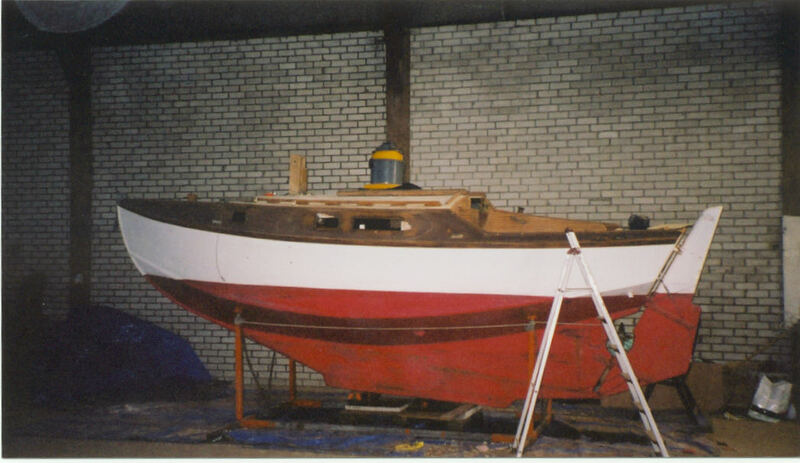 It shows the WD Pochard nearing completion, home built by Mr Chapman of Essex. Here she is having the rig fitted. 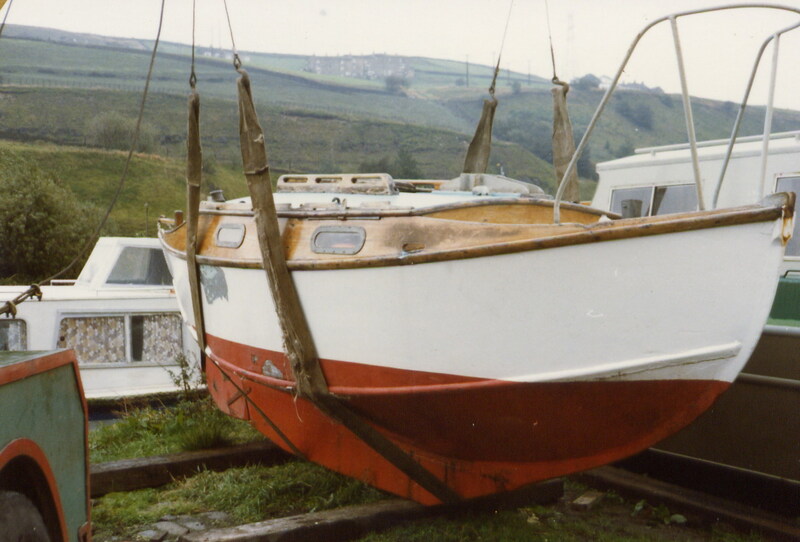 I knew 'Pochard for many years when John Ashley owned her. He sailed her everywhere. He told me once how he had become shipwrecked in her, on the beach off Clacton. Sailing down the Wallet in thick fog he got the idea to follow the contours, except he chose the 1 fathom depth, and hit the end of a breakwater!! Beached and repaired the next tide she was off on her adventures again. Resourceful man that John! Next time he will chose a deeper sounding though! We have just heard she has been dug out of a farmers field, literally and the new owner, restoring her, has joined us. Lets she how you are getting on. Send in a new pic please! 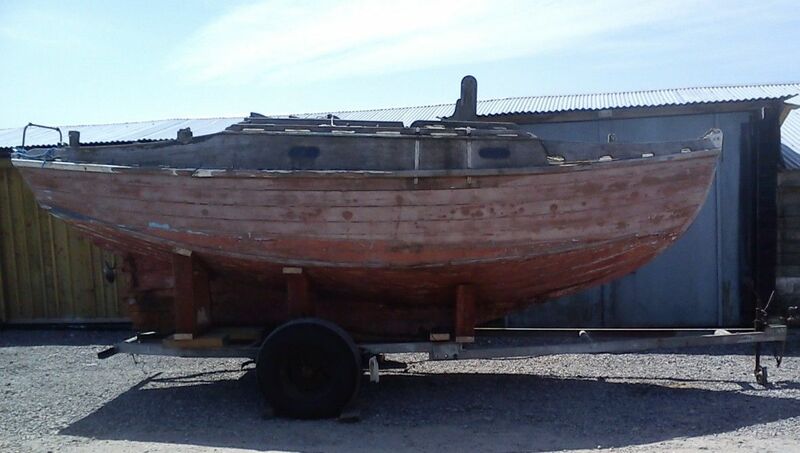 'Hellebarb' Joe in Amble has just started restoring this Wild Duck. I last saw her when she used to sail on the London River, many moons ago. Joe has agreed to have a page on the Builders and restorers section, as there were a lot of pics with this one. Click here to go to her page. 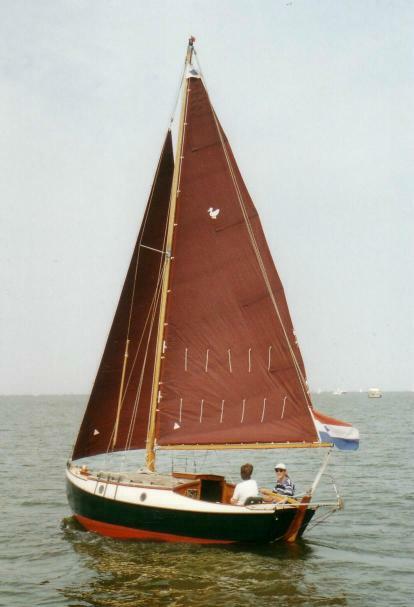 'Grauwe Razer' owned by Benne in the Netherlands. A steel 6.3 metre version. Owner joined us April 2012. Maybe another to attend the Dutch Meet this June? Dear boat friends, I would like to tell you that I bought a Wild Duck yesterday . It is a Wild Duck build in steel in 1964. The design was altered to steel by Mr. Bouma, a eye surgeon here in Groningen. He used the drawings of Buchanan and changed them for steel building. Apparently 7 were built by the yard. 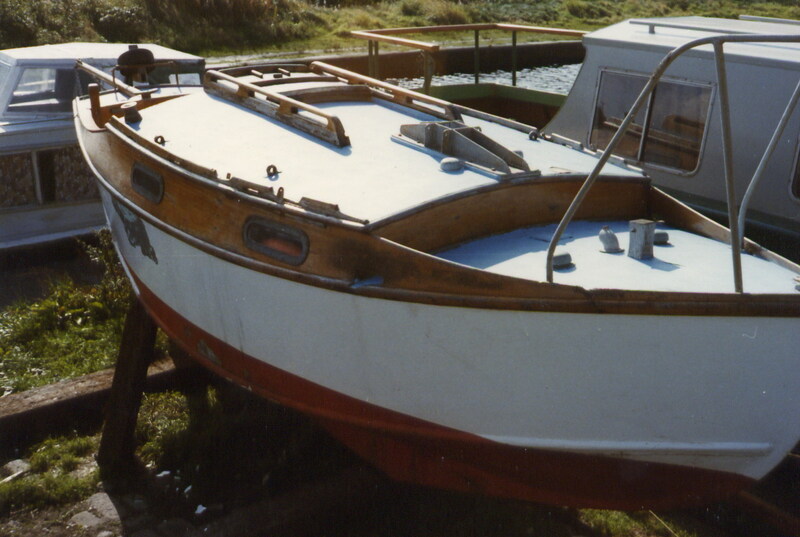 It is now lying in the marina of Zoutkamp. The engine is a 7 hp Faryman. I will send you information of what I am doing with this Wild Duck. There is a lot of work to do. Please let me know if you like to hear more from me. all the best, Benne Holwerda, Groningen, The Netherlands. Since last weekend I am sailing, after a lot of work. 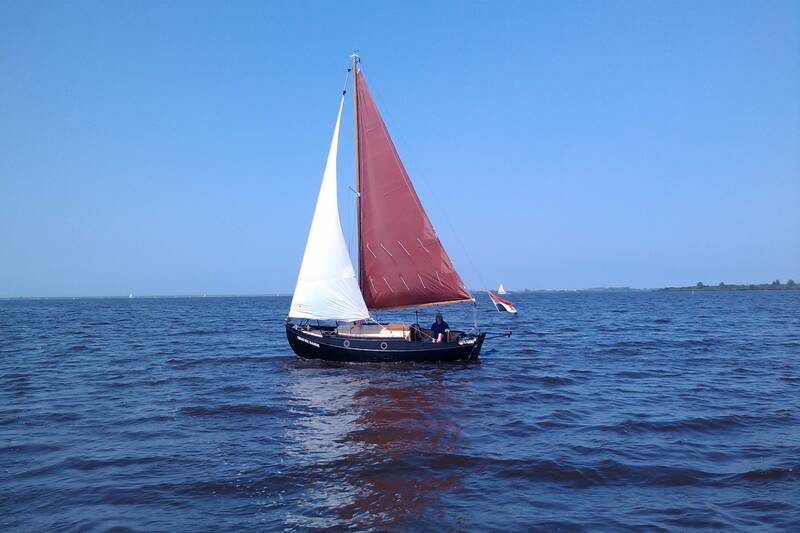 Two photo's of the result, later I hope to mail pictures of the Grauwe Razer under sail. Congratulations to Benne! She sails! 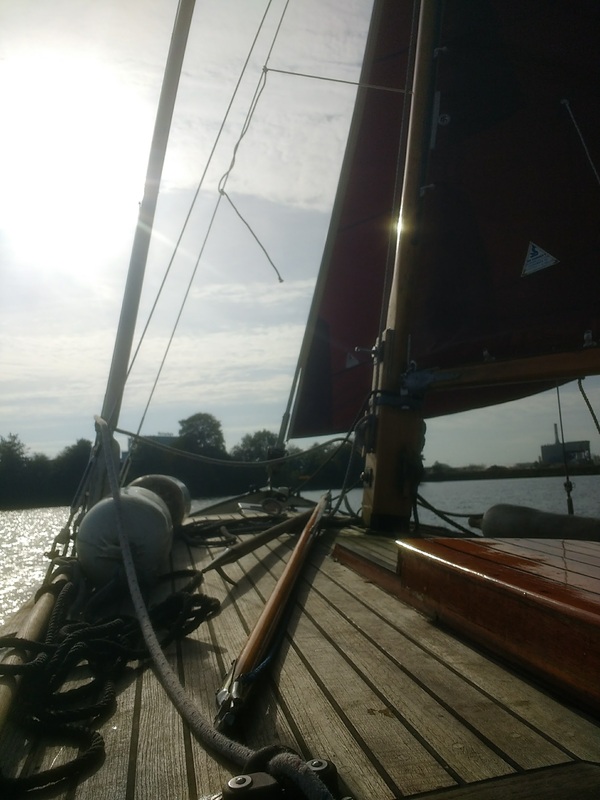 After a lot of refitting here she is sailing well! 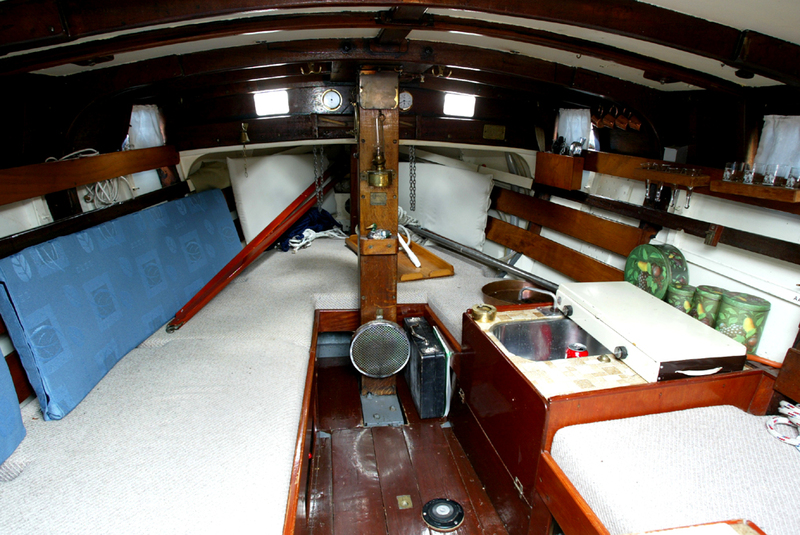 December 2014 Benne has sent in these great pics of the cosy interior. The Sailor VHF is used as a VHF receiver apparently! The planked interior looks warm! And boy does she sail well! Look mum no hands! Wild Duck in the Netherlands, 'WD40' Great name! Lost the owners details in the pile of paper and mails here, please step forward! Should have looked at the mails, welcome Toine Bles who mailed me to remind me! I knew this boat as ‘Die Struise’ when we were in Goes years ago! Toine keeps her in the Netherlands and sails Westeinder. We gave her the name, because my ex-girl and I liked the smell of it when we bought her. And yes, we like WD40 too, I do not know if that's healthy!!. We bought after I had a serious accident to be able to do stuff together, as walking and other intensive movement didn't workout that good any more. We gave here a proper paint-job and I did (with the necessary painkillers) a good job on the woodwork to prevent waves leaking from the deck to the interior of the ship. Anyway, we had to sell her, because maintenance was coming down mostly on my girl as I suffered from chronic pain. The WD40 has been sold, the relationship gone, good memories remain. I'm happy to see our Wild Duck posted on Eventides. To be more precise 'was ours'. Because we sold her to Toine Bles, who I think is still the owner of this marvellous little hero. 'Red Sky' so good to see Red Sky alive again. 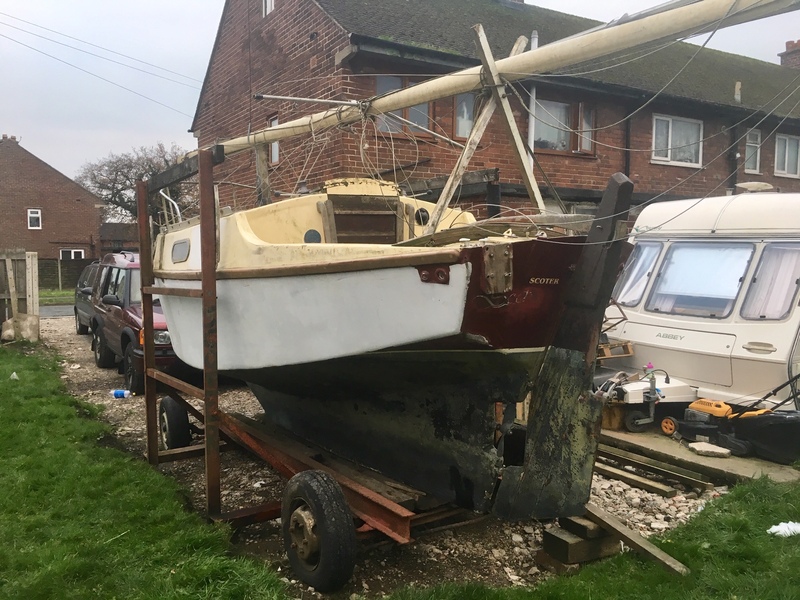 We knew her many years ago when Rob Swift and later his son Ed sailed her all round the Thames Estuary and Essex, Suffolk rivers. 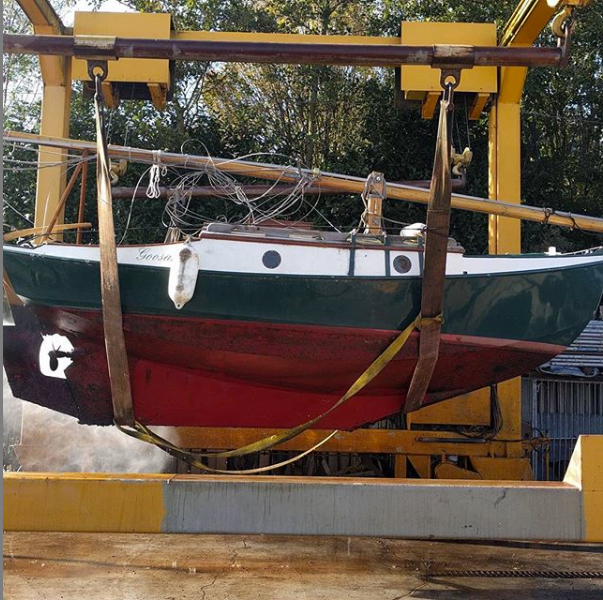 She is now in Kent at Lower Halstow and about to be launched back into commission. Built in 1950 she has survived well it seems. New member Steve Eastwood is fitting her out now 2013. Several members reported this WD as it was for sale on EBay, September 2018, hope she found a good home.. Will the new owner come forward we wonder? 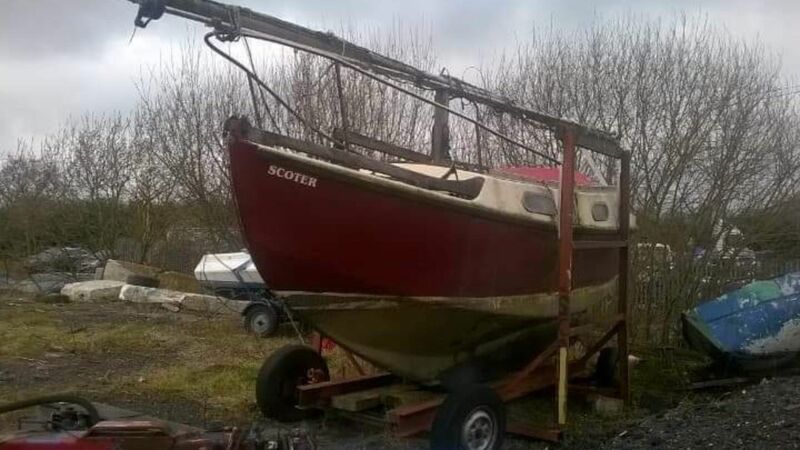 'Scoter' a WD found on EBay by Mat, a Steering Group member. Seller Phil did not know what he had. We were able to add information and within a day or two James had seen it and bought it. Scoter is made of GRP. A real rarity, they were not commercially made in GRP. Hoping to get some better photos shortly. Scoter hauled to James's garden cleaned off awaiting refurbishment.